Hey, remember K5, that security robot that inexplicably has a name closer to the Doctor's trusty robot dog companion than to the Daleks it actually looks like? It's finally starting to live up to its appearance after some early troubles with existential crises, as it was put into use on the sidewalk around the San Francisco SPCA to prevent homeless people from daring to think they can rest there. San Francisco Plans for First Transgender Historical District in the U.S.
San Francisco recently announced plans for Compton's TLGB District, an official historical district that will cover six blocks in the city's Tenderloin neighborhood. Activists successfully pushed for the District to prioritize safety and economic stability for current trans residents. Ceci est une paire de lunettes. 17-year-old TJ Khayatan was hanging out with some friends recently at San Francisco's Museum of Modern Art, when he noticed some of the pieces weren't as elaborate as he'd expected them to be. PrankvsPrank's Jesse Wellens and cosplayer Jessica Shanholtz did their best Aladdin and Jasmine while riding through San Francisco on this magic carpet -- probably a boosted board, not to ruin the illusion or anything. Last night, long after some petitions turned into a unanimous California Assembly vote, the first official signs denoting the Golden Gate Bridge's north side tunnel as the Robin Williams Tunnel were placed. Netflix's Fuller House dropped today, so you may be considering taking a trip down Nostalgia Lane tonight. However, before you do that, check out this parody video set to the Full House theme. Thus far, Airbnb has sunk about $8 million into a counter-campaign, and these ads are the latest attack. I went to look for a top pic and then this happened so now it's the top pic. Enterprising Girl Scout Danielle Lei is at it again, doing a brisk trade outside of San Francisco's The Green Cross, one of the city's medical marijuana dispensaries. This is clearly the first step to Google building its own underwater city. The future portable showroom that Google recently docked at a former navy base in the San Francisco Bay (or as it's better known, the Google Mystery Barge) might have to be cast off, according to officials. Why? Because they don't have the proper permits. Why not call it the mistle-drone? Oh, because that sounds like missile-drone, which is terrifying. In an effort to make drones appear less threatening, two interactive artists attached some Christmas decorations and a bit of mistletoe to a drone, because what's more relaxing than a flying robot goading you into kissing someone? They also clearly didn't consider that we'd all want to call it the mistle-drone, which sounds exactly like missile-drone. Forget Affleck, Miles Scott is the real Bat - and we all know it. You've all seen Batkid - alter ego Miles Scott - save Gotham City from the forces of evil. Now, thanks to one or more generous and mysterious citizens, Batkid can watch over his territory full-time - via billboard! #SFBatkid is trending on Twitter, because this is incredible. San Francisco is gearing up for Batkid today as Make-A-Wish transforms the city into Gotham City for 5-year-old Miles to save the day. Twitter is already exploding with pictures and fans cheering for Miles, and the event hasn't even started. Expect to see a lot of heart-melting child heroics later in the day. It's the wish Miles deserves and the one he needs right now. Sadly, five-year-old Miles is struggling with leukemia, but the Make-A-Wish foundation is coming together with the city of San Francisco to make every kid's dream of becoming Batman a reality for him. Thanks to thousands of volunteers, the city will be transformed into Gotham on November 15, and Miles will save the day. The Internet isn't a series of tubes, but Hyperloop probably is. PayPal, Tesla, and SpaceX founder Elon Musk is going to lay out his latest futurist idea today at 1:30 PDT (4:30 Eastern). It's called the Hyperloop, and it's a transit system that can go between San Francisco to Los Angeles in only 30 minutes using magnetic levitation and Futurama-esque vacuum tubes. Our hearts are often warmed by threats of violence. The Run the Jewels show the other night in San Francisco was apparently pretty great -- except one concertgoer found herself distracted by the guy she saw wearing Google Glass. So she decided to let him know with the above Missed Connection post, and the rest of the Internet is better for it. Hey guys, weather is kinda cool. If you just spent a half hour on the packed, humid subway train, full of people with coffee breath who smell faintly like wet dog, then this video is just what you need to restart your morning. Photographer Simon Christen spent over two years filming the fog rolling over San Francisco at dawn, and calls his completed work a "love letter" to his favorite natural phenomenon. It's pretty beautiful, guys. Two days ago we got word that Apple was dropping the eco-friendly EPEAT certification from all its products. The move was unusual for Apple, which has spent several years trying to green-up its act. Now some consequences of that decision are coming, as the city of San Francisco says that it won't buy any more Apple products. Meanwhile, Apple says its as green as ever. Some people struggle to find constructive means of expressing themselves, but San Francisco artist Doctor Popular has found a an outlet for his personal disgust over the recent pepper spraying incident at the University of California Davis. 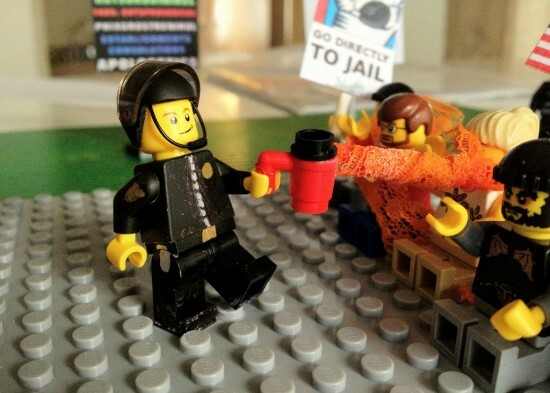 Using an abandoned newspaper bin as his choice location, Doc Pop installed a startling LEGO diorama featuring the notorious "casual pepper spraying cop" Lt. John Pike and a group of red-eyed protestors. See more pictures, after the break. 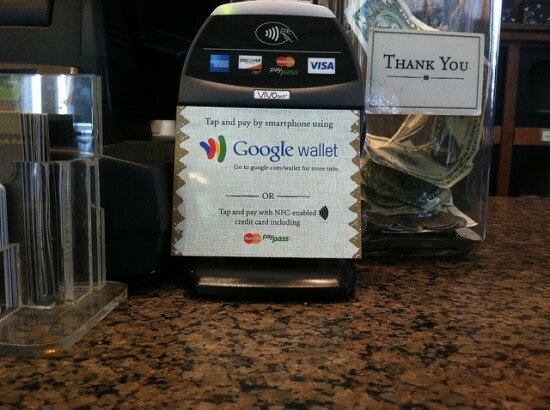 With no fanfare, Google Wallet launched today insofar that Google Wallet modules have been spotted out in the wild. Yesterday, TechCrunch reported on an email to Google Wallet partners that out-and-out said the launch would be today. Now, despite the fact that the official website still says "Coming Soon," a module was spotted at Peet's Coffee Shop in San Francisco. While Google Wallet is nothing to sneeze at, it sort of makes sense that it would roll out without the red carpet for a couple of reasons. The only currently compatable phone is the Nexus S 4G, which is only available with Sprint, and only in the U.S. Also, merchants need to have the Google Wallet module in order to take payments. and MasterCard is the only credit card partner for the moment. Suffice it to say not many of us are really able to use Google Wallet right out of the gate.